The FLAME TREE COLLECTABLE CLASSICS are chosen to create a delightful and timeless home library. Each stunning edition features deluxe cover treatments, ribbon markers, luxury endpapers and gilded edges. The unabridged text is accompanied by a Glossary of Victorian and Literary terms produced for the modern reader. Jane Austen has great fun with this novel, teasing at the social mores of her time, where the hunting of a suitable partner is an all-consuming game. 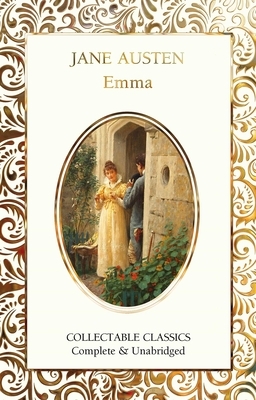 Emma Woodhouse is a confident, elitist young woman, whose self-belief leads to a series of romantic misunderstandings as she makes and breaks engagements for her companion Harriet Smith. Emma assumes that Elton desires to marry Harriet, but actually Elton really wants Emma. Frank Churchill too tries to win her, but Emma falls for Mr. Knightley, whom everyone thinks is in love Jane Fairfax. In the end, everything all is mended, as Emma and Mr. Knightley finally get engaged, and Harriet and Robert Martin are brought back together again. In the history of literature, few female authors have attained the enduring popularity of Jane Austen (1775-1817). Her exquisite, finely tuned novels have captivated readers for two hundred years, and her reputation shows no signs of diminishing, fuelled by high-profile TV and film adaptations of her writing. The substance of her work, and the source of her appeal, is quintessentially English. She takes the reader into the subtle cultural, linguistic and romantic codes of nineteenth-century English society, and in doing so creates some of literature's favourite heroes and heroines.